Resident crew members, Commander Jeff Williams and Flight Engineers Aleksey Ovchinin and Oleg Skripochka, had the Space Station to themselves since the June 18 departure and landing of Yuri Malenchenko, Tim Peake and Tim Kopra after a stay of half a year. 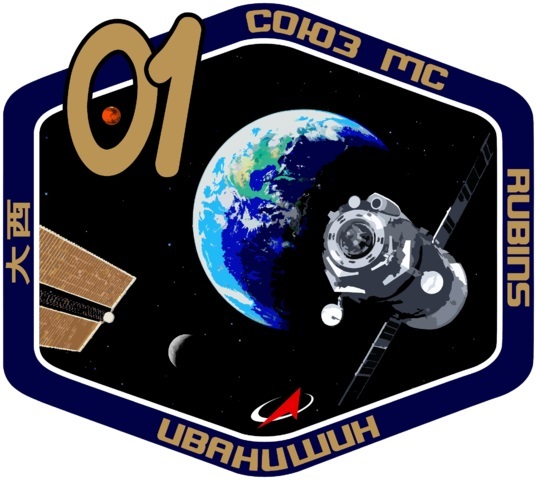 The three-crew period was initially planned to be only one week in duration, but the launch of Soyuz MS had to be pushed back two weeks due to a late discovery of software issues within the rendezvous program. Soyuz MS-01 and its three international crew members lifted off from the historic Site 1/5 launch pad at the Baikonur Cosmodrome at 1:36 UTC on Thursday atop a Soyuz FG rocket. The Russian workhorse rocket delivered a picture-perfect ascent, arriving in its target orbit less than nine minutes after launch. The crew then oversaw the deployment of the new and improved Solar Arrays and the KURS antennas of the spacecraft as well as the pressurization of the Propulsion System. Ingressing the Orbital Module, the three were set for a two-day commute instead of the six-hour launch-to-docking profile to facilitate testing of the Soyuz MS systems upgrades. Though many of the new systems were sequentially introduced on the recent Soyuz TMA-M flights and were tested on two unpiloted Progress MS missions, a combined test off all systems on Soyuz was needed to validate their functionality in an operational environment. Soyuz MS hosts a revamped electrical system with more powerful solar cells and larger active area on the solar panels, increasing by 1.1m² compared to the Soyuz TMA-M, creating a 25% increase in power supply. A fifth battery unit was added to provide additional power storage capacity. The Propulsion System was modified to replace lower-thrust DPO thrusters with 130 Newton engines to allow the thrusters to be re-arranged into two independent manifolds, installing all engines in pairs to provide full redundancy of the attitude control system. This architecture also improves the contingency deorbit burn scenario by raising the number of DPO thrusters available for delta-v burns from two to four. Tested during the crew’s two-day trip to ISS was the new Unified Command and Telemetry System, replacing the Ukrainian-built Kvant-V radio. Soyuz MS is capable of communicating with the ground through Russia’s Luch Data Relay Satellites, covering about 70% of the vehicle’s orbit around Earth, vastly expanding communications from short ground station passes on about half the daily orbits. 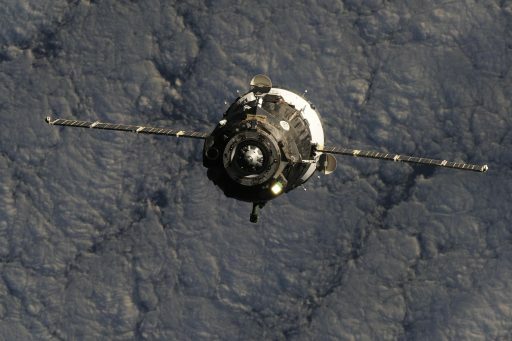 Inbound for docking, Soyuz initiated its Automatic Rendezvous Sequence at 1:51 UTC on Saturday when still in an orbit 110 Kilometers below that of ISS, catching up from behind and below. A ground-targeted burn, DV4, increased the vehicle’s velocity by 21.74 meters per second and marked the first in a series of Rendezvous Impulse burns to bring Soyuz to ISS. Reaching the 200-Kilometer communications zone around ISS, Soyuz powered up its KURS-NA System that had completed flight testing on four Progress missions before being introduced on the Soyuz. The new system reduces the amount of antennas installed on Soyuz, cuts the mass of the system and delivers better accuracy. Once activated, KURS-NA searched for beacon signals coming from its KURS-P counterpart on ISS to lock onto the Station’s signal and re-orient Soyuz to face the new AO-753A phased array antenna toward ISS for pitch and line-of-sight angle measurements. AO-753A, installed on the Orbital Module, replaces the VKA omni-directional antennas used in the early rendezvous phase and the complex 2AO rotating antenna that was previously used for angle measurements during the far-field rendezvous. 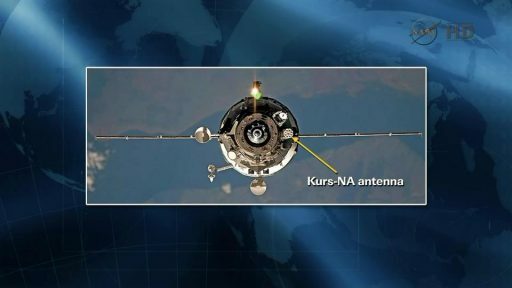 Later in the rendezvous, KURS used the two ASF-1 antennas retained from the KURS-A system to deliver range and range rate information in addition to the angular information. 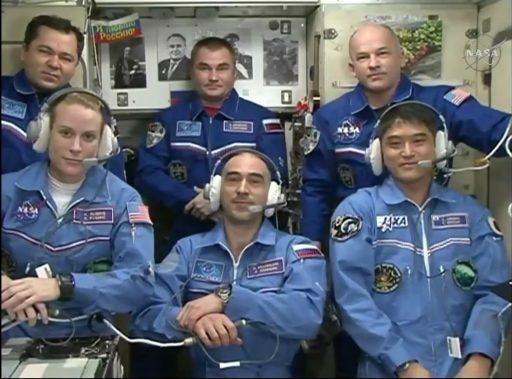 A two-way communications link between Soyuz and ISS was established to enable the crew to talk to Mission Control Moscow as they continued watching over their spacecraft. 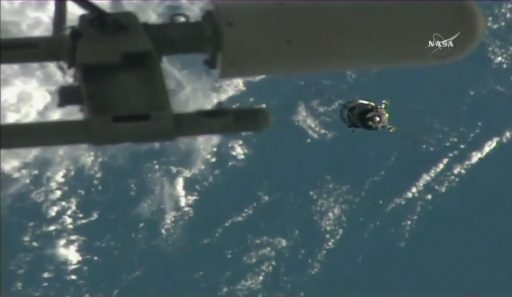 The 34.27m/s DV5 burn at 3:00 UTC delivered Soyuz to a trajectory towards is Ballistic Targeting Point, offset one Kilometer from ISS to preserve the option of a passive abort until late in the rendezvous when the targeting offset was reduced. 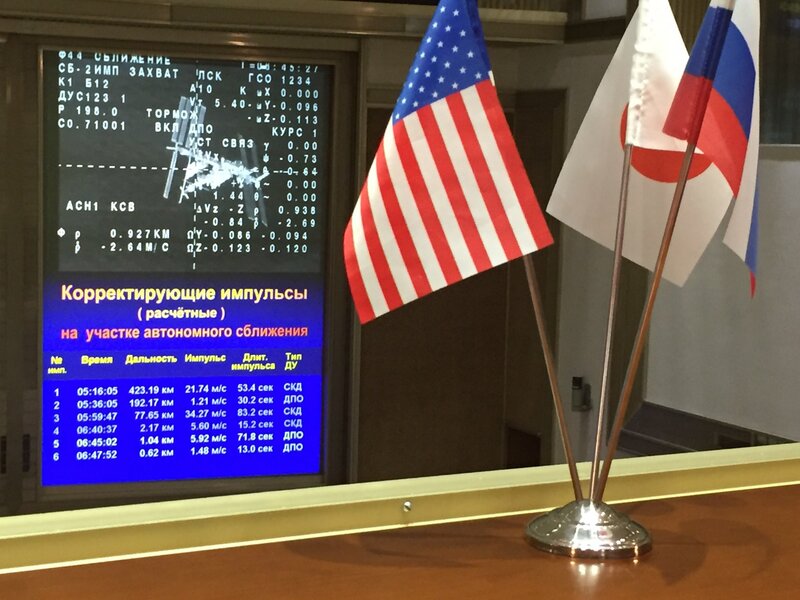 Soyuz continued under automated control after the KURS-P on ISS and the KURS-NA on Soyuz was checked twice, at 45 and 15 Kilometers. 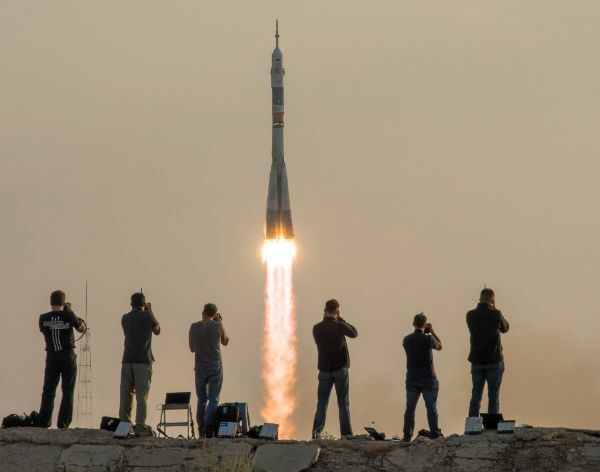 Starting the close rendezvous, Soyuz conducted a series of impulse maneuvers, swinging back and forth between line-of-sight attitude and burn orientation. When Soyuz headed inside five Kilometers to station, a series of three rendezvous impulse burns were completed using the SKD main propulsion system to reduce the intentional targeting offset from one Kilometer to 750 meters and then to 300 meters before fully eliminating the offset and beginning to aim for the Station. 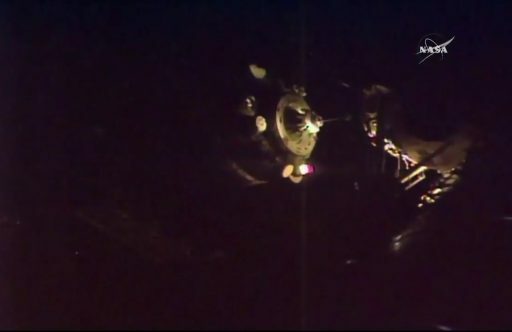 Soyuz then hit the brakes with its DPO thrusters to set up for the flyaround that automatically started at a distance of around 400 meters to line the Soyuz up with its Rassvet Docking Port. The vehicle remained very well behaved and flew in auto control to reach a position 200 meters from ISS, looking straight down the barrel of the Rassvet Mini Research Module. When reaching that point, Soyuz halted its approach, made a roll adjustment and awaited inputs by the crew. Stationkeeping was used for a very brief assessment of systems status and alignment before Soyuz was allowed to close in on ISS for a straight-in final approach. 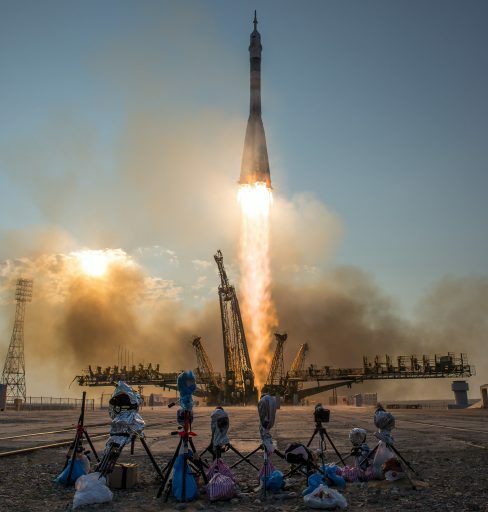 Gently firing its DPO thrusters, Soyuz started closing in at a relative rate of 0.8 meters per second, keeping its crosshairs aligned with the docking target by pulsing its DPO thrusters to remain on course. 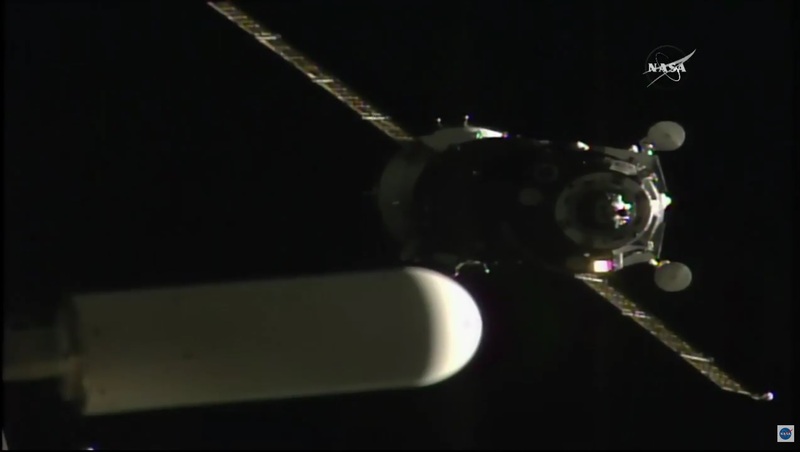 The Docking System was powered up and Soyuz reduced its speed to just 0.1 meters per second as the sun set on ISS and the approaching spacecraft. Upon contact, the docking probe slid into the docking cone on Rassvet and the detection of contact triggered Soyuz to fire its DPO thrusters to push forward and ensure that capture latches would engage to create a safe docking. 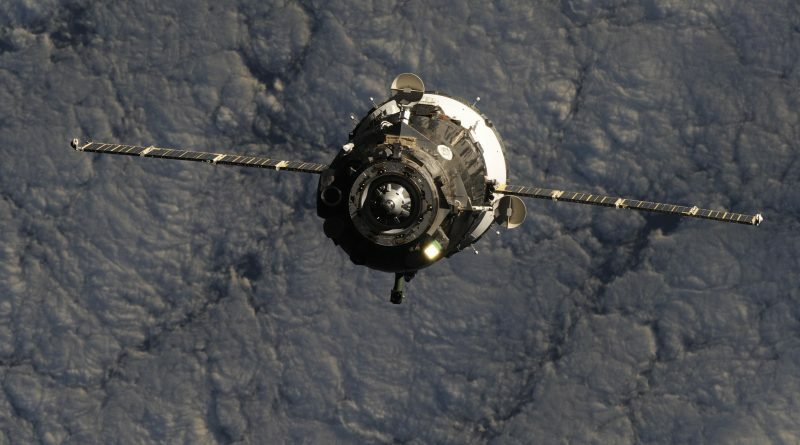 Once a good capture was sensed, Soyuz and ISS went into Free Drift, disabling all thrusters. Docking occurred 400 Kilometers above the Pacific Ocean with Soyuz and ISS inbound for a pass over the southern tip of South America. After docking, relative motion between Soyuz and the Station was allowed to dampen out for several minutes before Soyuz commanded its docking probe to retract, pulling the two docking interfaces close together to permit the closure of hooks to form a hard-mate between the two spacecraft with pressure seals in close contact to be able to hold pressure. With a hard mate in place, the crew was given a GO to begin operations to switch the Soyuz to hard line communications and transition the vehicle to ISS power supply. The next step was the standard one-hour pressure check that was initiated when the large and small vestibule between ISS and Soyuz were pressurized for measurements of tightness via pressure readings obtained every five minutes. While leak checks were in progress, the crew can get ready for their arrival aboard ISS, putting on their flight suits and stowing the Sokols worn for launch and docking. The final item prior to hatch opening was the equalization of pressures between Soyuz and ISS, clearing the way for Anatoli Ivanishin to open up the Orbital Module’s hatch. Hatch opening was officially marked at 6:26 UTC. Floating aboard ISS, Anatoli Ivanishin returned to a familiar environment after spending 163 days aboard the complex in 2011/12. Takuya Onishi and Kate Rubins see ISS for the first time after seven years of training preparing them for their mission. Greeted by the resident station crew, the new arrivals floated to the Zvezda module for the traditional post-docking family conference. For their first day aboard ISS, the combined crew is set for a series of safety briefings during which Commander Williams will walk the new crew through emergency procedures and the location of fire extinguishers and personal protective gear. The Soyuz crew will later deactivate their Spacecraft, set their Sokol suits up for drying and prepare their crew quarters aboard ISS for their first night in the comforts of the Space Station, having been in a tight squeeze aboard their Soyuz for two days. 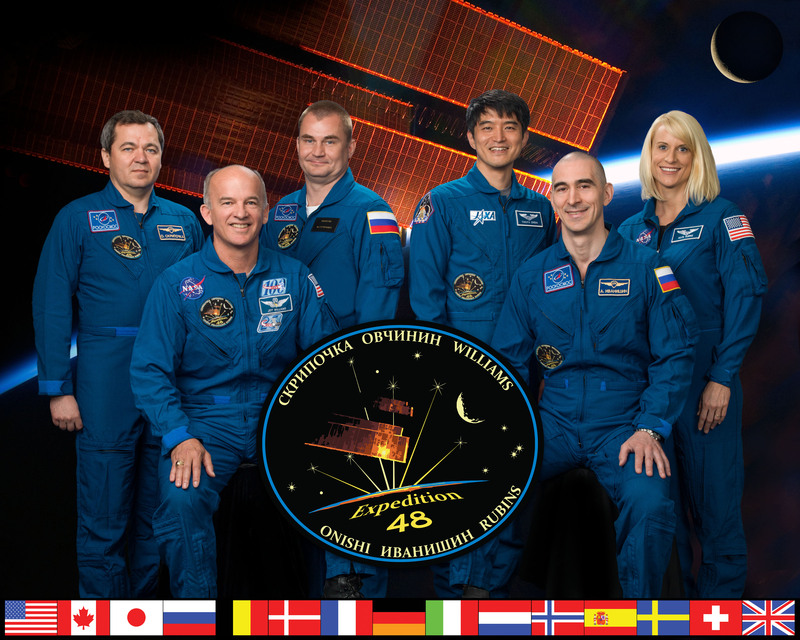 Now back at a full staff of six, ISS is looking forward to a few busy weeks for the remainder of July. Aside from their busy schedule supporting over 35 hours of experiment operations a week, the crew will be welcoming a pair of visiting vehicles later this month. 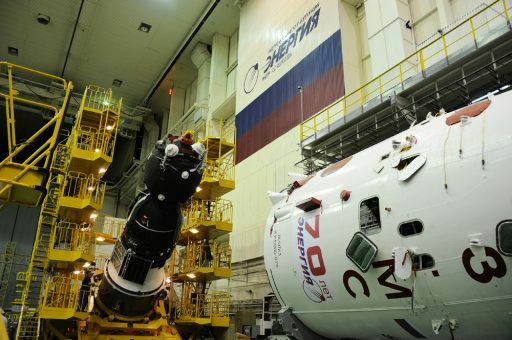 A Soyuz 2-1A rocket will lift off with the Progress MS-03 Cargo Craft on July 16, sending 2,500 Kilogram of supplies on a two-day rendezvous with the Station. Just as Progress MS-03 makes its arrival at ISS, SpaceX will launch a Falcon 9 rocket with the Dragon SpX-9 spacecraft on the 18th for a two-day trip to the orbital laboratory, carrying supplies for the crew and the first International Docking Adapter to arrive at ISS. The International Docking Adapter will be installed as part of one, possibly two, spacewalks carried out by Jeff Williams and Kate Rubins this summer to ready ISS to welcome Commercial Crew Vehicles. Expedition 48 will conclude with the return of Williams, Ovchinin and Skripochka in September. The three Soyuz MS-01 crew members are booked for a stay until at least early November, though the ISS schedule remains a fluid construct with frequent changes until dates are set in stone.